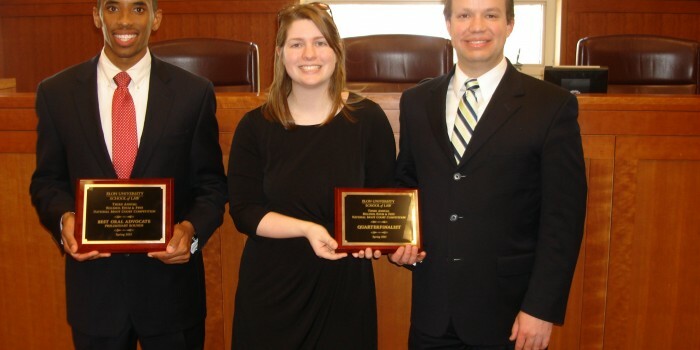 The Wake Forest Moot Court team consisting of Bethany Corbin (’14), Nathan Harrill (’14), and Justin Jenkins (’14) went 4-1 and advanced to the quarterfinals of the Billings Exum Frye National Moot Court Competition hosted by Elon Law School on April 5-6. Harrill earned the award of First Place, Best Oral Advocate for the three preliminary rounds. More than 100 law students presented oral arguments in the preliminary rounds, making Harrill’s achievement as the best oral advocate especially impressive. Thirty-five teams from law schools around the country – including such Moot Court powers as Texas Tech, South Texas, Florida Coastal, and Regent – participated in the competition, which is named for three former Chief Justices of the Supreme Court of North Carolina. This year’s problem had two criminal law issues, including whether a search of the defendant’s home violated the Fourth Amendment, and whether the defendant’s possession of a sawed-off shotgun counted as a predicate offense under the Armed Career Criminal Act. The Wake Forest team went undefeated in the three preliminary rounds, topping teams from William & Mary (which won the competition last year), Charlotte, and Florida State. In two of those rounds, the Wake Forest team would not have won without having the better brief score, showing the importance of a great brief. Then, in the first elimination round, Wake Forest bested a team from Florida Coastal by only 11/100 of a point, and again it was the brief that made the difference. Finally, in the quarterfinal round, the Wake Forest team was eliminated, by a team from South Texas. Due to pairings and coin tosses, the Wake Forest team had to argue “off brief” in four of its five matches. The “off brief” side seemed more difficult factually and legally, making the team’s 4-1 record even more impressive. The team appreciated and benefitted from practice argument judging by Professors Ron Wright and Bill Marsh; alumni Luke MacDowell and Katie Serfas; and 3Ls Rory Agan, Kelley Chan, Laura Esseesse, Melissa Evett, John Forneris, Dylan Greenwood, Hillary Kies, and Morgan McCall.